Be yourself & feel more at home with this eclectic line of furniture & decor. Inspired by Drew Barrymore’s personal aesthetic, it transcends time & style—enveloping you in an inviting, authentic atmosphere you’ll love. Pair clean lines with plush textiles & sleek accents to create a refined, relaxed look in your bedroom. Decorating your home so it looks just the way you want it to is one of the easiest ways to enjoy it to the fullest. Whether you're sprucing up your entire space or looking to start with a particular room, we make it easy to find the decor and essentials you need to beautify the area and make it more functional. Use the different product category links on this page to move through your home and find the supplies you need to create a welcoming living space for yourself and for guests, all at Every Day Low Prices. The common areas are often the focus of the most detailed decorative efforts in a home. From special centerpieces to decorative throw pillows and eye-catching accents, your kitchen, dining room, entryway and outdoor areas offer a lot of opportunity to create a welcoming, relaxing atmosphere. These are essential rooms for decor in any situation, whether you're entertaining friends, welcoming family for an overnight stay or simply wanting to make your own space a more beautiful spot to spend time in. Kitchen: Get ready to prep and cook with perfection. Discover all the bakeware and tools necessary for creating your famous desserts and show-stopping main-course dishes or taking your culinary efforts to new heights. Basic kitchen tools and portable appliances help home cooks cover all the bases for easy weeknight classics and special-occasion treats. If your kitchen needs a little design pizzazz, look for decorative yet functional accent pieces, like some comfortable bar stools or countertop organization accessories in fun colors and updated finishes. Dining room: Whether it’s a large, multigenerational family gathering or a weekday in the breakfast nook, dining areas benefit from a few key supplies any time of year. Colorful place settings and table linens form the foundation of any meal. Customize your eating spaces with different colors and accents to create a design theme in the space. Build a collection of bright placemats, flatware and other mealtime components to explore your creativity and make meals feel more festive. Stock the bar area with durable drinkware and accessories that add touches of elegance. With serving, drinking and eating supplies for a variety of different events, this section is a must-visit when you want to refresh your approach to entertaining — or everyday dining in style. Entryway: As the first impression you and your guests get when stepping into your home, the entryway is the perfect place to make a big decorative impact. This space also calls for functional additions that make life easier for you and anyone who enters your house. As a catch-all zone for everything from shoes and coats to keys and backpacks, it helps to use furniture and accessories with built-in organization here. Discover storage benches, console tables, coat racks and other pieces that look great while giving you plenty of ways to corral loose items. Patio and garden: The supplies in this section make it a breeze to polish your patio and garden so they become as neat and welcoming as possible. Find cozy lounge furniture and outdoor heating equipment, such as fire pits, in this section to make the perfect gathering place for friends and family. If you're hoping to transform your al fresco living area into something more functional, browse the outdoor lighting, dining and furniture options by using the filters on the left side of the page. You can create a whole new outdoor living space with weather-safe seating, barbecues and decorative accents. Bedroom and bathroom decor put the perfect finishing touches on the private spaces in your home. Delight kids and adults alike with special additions in these private rooms by clicking into each product category. Kids’ bedroom: Their bedrooms are the places in your home that your children really get to call their own. Make it easy for them to fully enjoy their special spaces with decorative accents and essential supplies that make kids' bedrooms comfortable and fun. Give stray toys a home of their own with practical storage furniture, or create a relaxing hangout zone with bean bag chairs and lounge seating. Or, revamp a room with a sturdy new bed and fresh bedding emblazoned with familiar character faces and bright patterns. Adult bedroom: Adults take their comfort seriously, too, and our Bedrooms product category offers a full range of the supplies necessary to encourage you to get rejuvenated. With basics like furniture and mattresses, this section has all the necessary building blocks for crafting a space of ultimate relaxation. 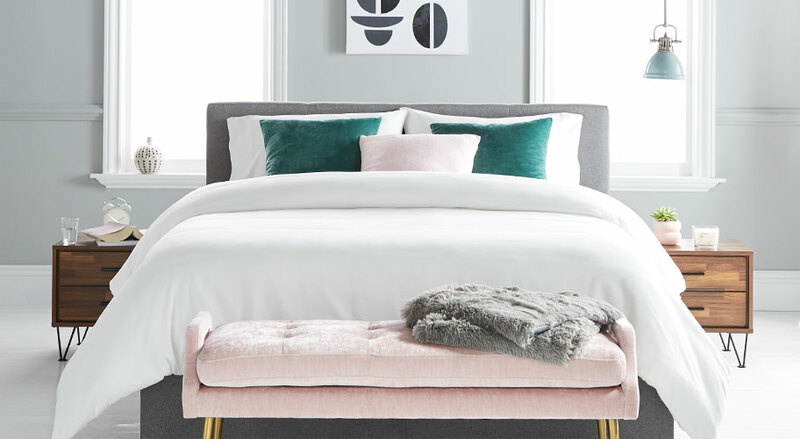 This section provides the extra sheets and decorative finishing touches you need to create a hotel-quality experience and enjoy a restful night's sleep. Bathroom: There's no need to fret about an outdated powder room or master bath. This product category helps you enjoy a total bathroom makeover without any renovation required. A new shower curtain, soap dispenser and some decorative hand towels can make a surprising difference in the look and feel of a bathroom that's in need of some TLC. Even if the current decor theme in your bathroom is something you love, adding some new personal touches enhances the general ambience you create.